Now for classification, besides protection. Easier management and better operation efficiency thanks to the use of Policies. With the introduction of Policies or Templates the configuration of the Policy applying to a protonized folder can be managed form the web console of the server side, instead managing locally. Thus, when we protonize a folder, we just have to set the Policy, previously defined in the web console, and/or classification level to apply to files in the folder. This way, folder management is simplified, and the operation of the folder becomes much more efficient as the complexity of the communication between the Prot-On agent that monitors the folder and the server is reduced drastically. 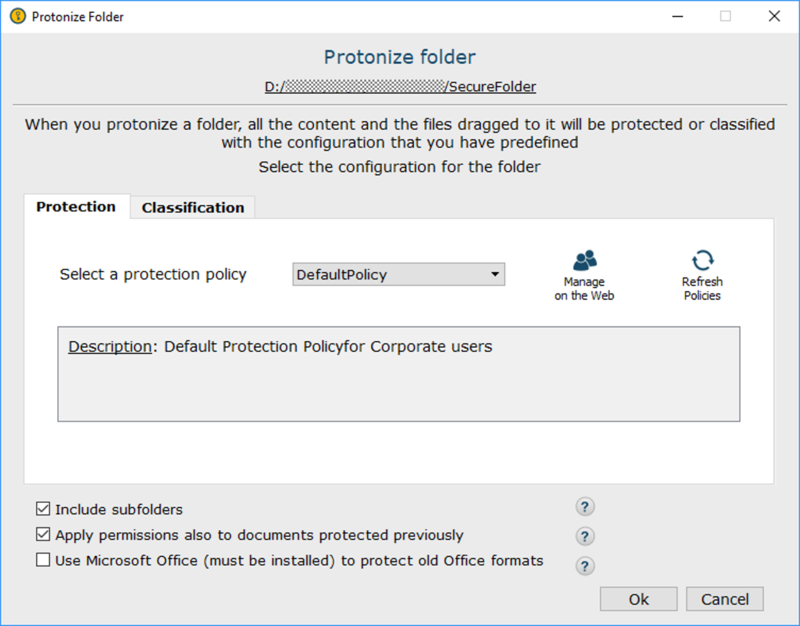 When the Prot-On client is upgraded to v3, if Protonized Folders exists, protection policies will be created automatically for each of the folders. Later you can change the Policy of each Folder if you want.